Millburn, said to be founded in 1807, was located in Inverness - just like Glen Albyn and Glen Mhor. They operated under different ownership though, and Millburn predates the other two distilleries. Millburn distillery started out as 'Inverness distillery' and was founded by Mr. Welsh - some claim as early as 1805. That means that it actually began in the days before the Excise Act of 1823 that legalised production of whisky. 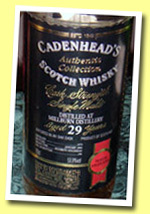 After whisky distillation was legalised the distillery was taken over by... More on Malt Madness.